PHP is a popular programming language which is utilized to build dynamic web applications with MySQL database connections. For a programming language to be successful, it must be comfortable and widely accepted by a large number of web developers. PHP is outfitted with many open sources integrated development environments. 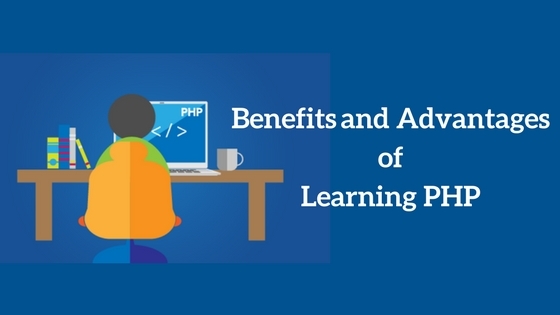 Moreover, there are a lot of benefits of learning PHP language. PHP offers a plenty of benefits that will surely deliver your limits of developing something outstanding. Not only is it open-source but also feature-rich and has all the functionality that a proprietary or paid scripting language would offer. PHP is easy to install and set-up. It is the prominent reason of why PHP is the best language to learn. In the software industry, there are many IT companies were looking for PHP developers. There are various benefits of using PHP which attracts people towards it. In this way, let us discuss the most important reasons to utilize PHP in web development. PHP is easy to learn, even if you have no more skills of programming. It is one of the essential benefits of learning PHP. Compared with other programming languages, PHP does not need one to spend a lot of time studying a manual. A complete web page will develop just a single PHP file. PHP has a compelling and easily understandable syntax. So, it is very familiar, and programmers are really comfortable coding with it. If you have any programming knowledge in both C and Perl, then learning PHP will be very easy, as its syntax is very similar to these programming languages. Since PHP is an open source web development language, it’s completely free of cost. PHP is available for free to every user, and the community of PHP developers gives excellent technical support. Therefore, all its components are free to use and distribute. Besides, PHP supports all of the leading databases, including MySQL, ODBC, SQLite and more. It is the main advantage of using PHP for web development. Depending on your coding ability, PHP can turn out to be an effective programming language to use. PHP is known to be versatile when writing code and also in making web applications. Furthermore, it is extremely reliable when you have to serve a few web pages. PHP has a large community of developers who regularly updates tutorials, documentation, online help, and FAQs. It is one of the significant benefits of learning PHP to learn from the communities. If you have any trouble when using PHP, it is the best place you can find all information about the PHP language. Apart from this, you will get tips and tricks from PHP pros through several websites and forums. Additionally, PHP has a great community and resources to learn PHP online. While different programming languages require long scripts, PHP can do that same work in a few lines of code. It has the maximum control over the websites. Likewise, whenever you want to make changes, you can edit easily. PHP runs on just about each platform available allowing it to operate across different operating systems. Whether it is a Linux, UNIX, Mac OS, and Windows; it also supports all the major operating systems. It is one of the vital benefits of learning PHP to develop your skills in web development. Apart from the operating systems, it also supports all major web servers like Apache, Microsoft IIS, Netscape, personal web server, iPlanet server, etc. As the programming language works with many operating systems, it will deploy on different platforms. PHP uses its own memory space, so the workload of the server and loading time will reduce automatically, which results into the faster processing speed. The processing speed is fast, and web applications like eCommerce, CRM, CMS, and Forums are also developed faster by it. It is the main importance of using PHP language in web development. PHP is one of the most secure ways of developing websites and dynamic web applications. PHP has multiple layers of security to prevent threats and malicious attacks. It is the major importance of using PHP to develop a hybrid web application. PHP is being utilized for two decades now since its beginning in 1995. It is one of the major benefits of learning PHP. It is trusted by a large number of websites, and web developers and the list is expanding day to day. Besides, PHP has demonstrated its ability and versatility by developing and maintaining some of the most highly visited and popular sites. Hence, these are the benefits of using PHP in the web development. It is advisable for you to use it in your next web development services project. Therefore beginners should take up a proper training for learning PHP programming language to get a good head-start in their career. Interested aspirants can enroll our PHP training course that will assist you to become a successful PHP developer.